Sarina is a tribal fusion dancer known for her quirky musical choices and her vaudeville style infused in her costuming and dance. 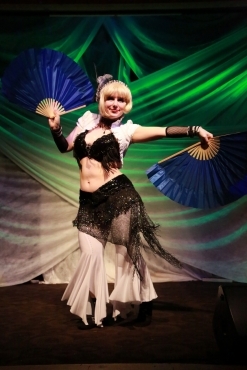 Whether she is dancing as an Orion slave dancer at Trek Theatre production, a steampunk performance at Fusion Friendly Events, a 1920’s jazz piece, or to her newest favorite soundtrack at a No Shame Eugene, she has a lot of fun with the art form. Sarina has been belly dancing for about 20 years, taking her first dance class with her mother in a little community center while she was a teenager. From that time she moved on to study tribal in Portland at Gypsy Caravan and Euphoria, and tribal fusion with Severina and Znama Studio, as well as with private instructors. While living in Japan, she studied Turkish style belly dance, break dance and salsa, and taught tribal fusion belly dance. Because she has also studied flamenco, tango and Hawaian hula, these also are infused in her dance. 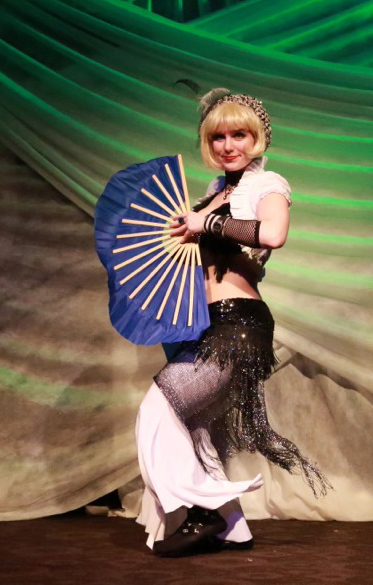 Sarina often draws on moves from other dance styles to meld with belly dance, depending on what feels appropriate with the style of music. Her costuming is often inspired by a theme started by her musical choice, and she makes and sells many of her costumes locally. Currently Sarina teaches Beginning Tribal Fusion and Intermediate Tribal Fusion at Willamalane in Springfield and Bellylicious Workout on Wednesdays at multiple locations and private lessons in her dance studio. Self care, which is a way of ensuring one’s overall mental and physical health, has gotten an increasing amount of coverage in the media over the past few years. However, what basic self-care and self-help guides frequently forget to indicate is how our physical, mental, emotional, and spiritual health are tightly linked and dependent on one another. This is why people who only pursue a diet without adjusting their exercise habits or exercise while subsisting solely on packaged foods often remain unfulfilled at heart. The good thing is that some small adjustments in each part of your life can have great effects, particularly when you are focused on bringing your entire body in sync with itself. With that in mind, here are some ways you can improve your overall spiritual wellness by making adjustments to your physical and mental health habits.